Blogger tried to ruin our game of Captcha Balderdash. Due to problems he was having, he took away over half of the definitions you all entered since Wednesday. These were the definitions that KLZ from Taming Insanity was supposed to judge so that she could pick her very favorite and crown a new Captcha Balderdash champion! Fortunately, she was able to look through them all before Blogger threw his big temper tantrum yesterday evening. I am so grateful that she was able to look through all 25 of them and find the one she liked best because I would not have been able to do it. I was laughing out loud all day at them! 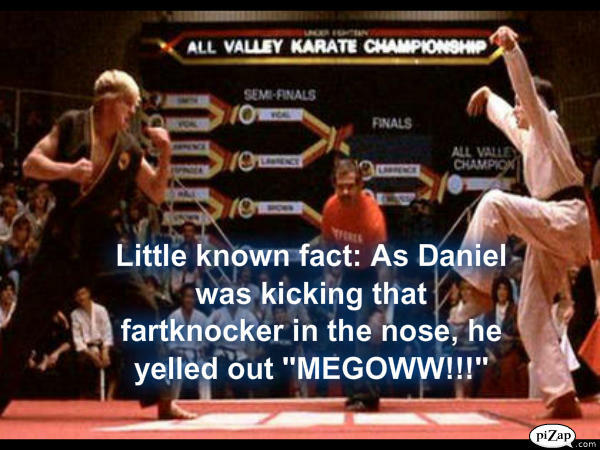 MEGOWW: The word used during fights when inflicting pain that gradually became replaced with “HiiiiiiiiYAH!! !” that we know so well today. [Katie wrote it better than that, though]. Katie is a lot of fun to read and to interact with on Twitter. Her blog always entertains me. She wrote a recent post about how her family does not watch TV and the reactions she gets from people over it. It was such an interesting post and really made me think! And I don’t think! So, this was a huge moment for me! She has many other posts that are thought-provoking, such as the one where she addresses the father she never met, and many that are just plain funny, like the one where she talks about underwear sizes. Another fun fact about Katie is that she used to be a bra fitter at JC Penney! Have you ever met one of those people before? Katie has a “contact me” page. I’m sure she would love to answer any of your questions! I hope you will go over to Katie’s place to say hello and check out what else she’s got over there.